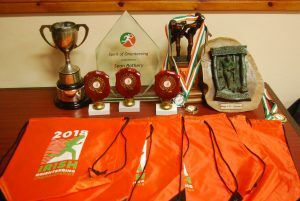 Well done to the 3ROC prizewinners and Irish Champions at the Irish Championships in Sligo and Donegal last weekend, and thanks to SligO and Fingal for putting the events on – no mean feat for Fingal in particular, based a long way from Donegal, largely in north Co. Dublin. 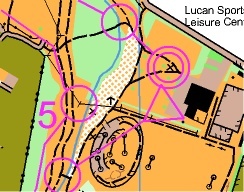 The Sprint at Sligo Institute of Technology saw Clodagh Moran take 1st in W18 and Con Carroll take 1st in M85, with 2nd places for M18 Aidan McCullough (by 2 seconds), Trina Cleary (W70) and Frank Martindale (M80). The map was excellent but the area was lacking in challenge and route-choice, rather like the JK Sprint at Easter. Nevertheless, a sprint as part of the IOC weekend is a real bonus. Apologies to the winners of the 2017 Sprint Champs which 3ROC ran at DCU in December as they only retained their titles for 5 months! The Middle Distance race on Saturday brought us to Barnsmore Wind Farm, into some tussocky, marshy slippery terrain, where 1st place went to Aidan McCullough (M18), Frank Martindale (M80) and Con Carroll (M85); 2nd to Pat Flanagan (M75), Clodagh Moran (W18), Mary O’Connell (W55) and Trina Cleary (W70), and 3rd place to Karen Convery (W40). Sunshine and spectacular scenery added to the atmosphere of the day and the local community hall at Leghowney provided food and shelter. The Relay on the sand dunes of Finner, near Ballyshannon, provided a complete contrast – fast and dry underfoot, with lots of contour detail and a new 1:7500 scale A3-size map. We only had two teams, in Handicap 12 and Handicap 18. A great opening leg from Aidan in the H12 class set up the team for a good result but CorkO’s Colm O’Halloran’s blistering pace on the final leg was too much and the team of Aidan, Ronan Cleary and John McCullough finished 3rd. A question lots of people asked was why the fantastic dunes of Finner hadn’t also been used for the middle distance event, but maybe there were reasons that we don’t know about. There was some compensation in the relay, though, since Colm Moran was on the winning UCDO team in the Premier class: well done! Full results, routes etc are here. Overall, Nick Simonin (BOC) had a really successful weekend, winning the Sprint, the Middle and the Long races, while in the Women’s races GEN’s Aoife McCavana won the Sprint and Middle, Ajax’s Róisín Long won the Long, and UCDO and GEN won the men’s and women’s relays. One to watch, though, is LVO’s Paul Pruzina who has recently moved from the Junior ranks and finished 3rd, 2nd and 2nd in the three individual races. There are photos of many of the 3ROC runners in IOC on the 3ROC Facebook page here. Next year’s IOC will be in Fermanagh on the May Bank Holiday weekend. 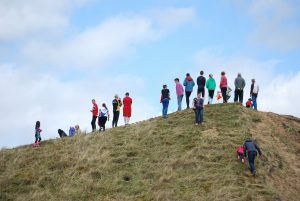 All in all, a great weekend’s orienteering and great preparation for the Shamrock O-Ringen in a month’s time in Cork & Kerry – entries close on Friday 11th May. The word is out that this may be the last Shamrock for some time, so make sure you enter and experience some really fantastic open-mountain orienteering in the south-west! See details of the Shamrock here. This weekend, members of the Irish Senior Squad are running an event at Cabinteely Park as a fundraiser, so please come along and support the team. Where is Cabinteely Park? See it here. 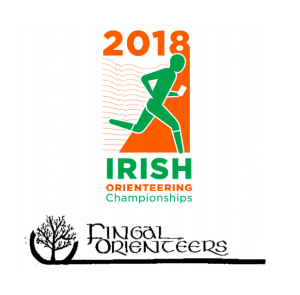 Further north, Fermanagh Orienteers are running the Northern Ireland Sprint Championships and also the Middle-Distance Championships at Fintona, Co. Tyrone on Saturday, with the NIOA AGM sandwiched between them. See here for details. In the coming week the CNOC summer evening series kicks off with an urban event in Naas on Tuesday 15th May. The IOA AGM took place last Sunday and there are some vacancies, if you are interested. The Chairman, Paul O’Sullivan-Hourihan, had to step down after his three years in office, so there is a vacancy there; there are also vacancies for a Technical Officer (filled in earlier times by 3ROC’s Harold White and Trina Cleary) and PRO (done in earlier times by John McCullough). Eoin McC takes 3rd prize. 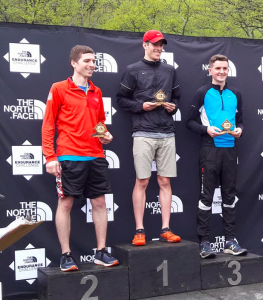 While the Irish Champs were going on, 3ROC’s Eoin McCullough was running in a half-marathon trail race at Bear Mountain State Park in upper New York State. 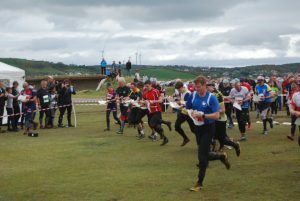 The North Face Endurance Challenge featured a range of races including the 21 km/715 metre climb race with about 700 runners. Eoin finished 3rd in a time of 1 hour 43, so well done! The IOA presents a special award, the “Spirit of Orienteering” Award, every year to someone who has made an outstanding contribution to orienteering. 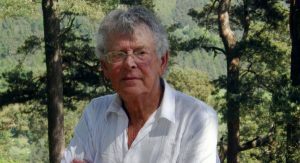 This year’s nominee was 3ROC’s Seán Rothery, who was one of the founders of Irish orienteering, together with the likes of Joss Lynam, Paddy O’Leary, Mike Lunt and others. Seán was lining up to be the first M90 Irish Champion this year and had entered the Irish Champs but unfortunately didn’t get to the event. He is a lifelong outdoor enthusiast, with mountaineering, skiing and rock-climbing along with orienteering. He was a founder member of Irish Orienteers (the first Irish O-club) and of IOA, as well as 3ROC. He was also involved in the Association for Adventure Sports and his two sons, Eoin and Colm, both now in Australia, are former Irish Orienteering Champions. He also designed the simple but effective 3ROC logo. Congratulations, Seán! You can see a photo of the award, with some of the other prizes for 3ROC members, towards the top of this page. Don’t forget to visit this page every week for the latest news, and to like us on Facebook! We’d love you to join us for your orienteering journey! You can join 3ROC or renew your membership online here.